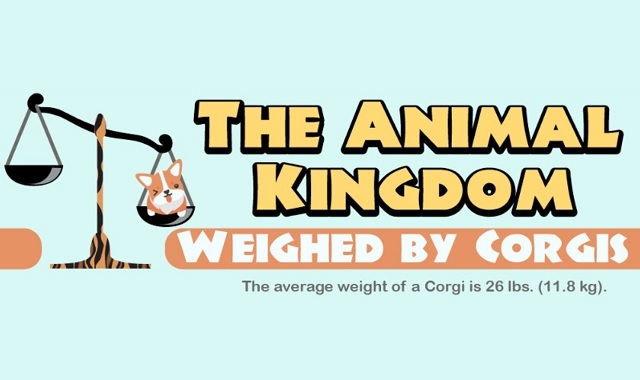 The Animal Kingdom Weighed by Corgis #infographic ~ Visualistan '+g+"
The American Kennel Club describes Pembroke Welsh Corgis as “affectionate, smart, and alert” as well as “low-set, strong and sturdily built” and that they give the impression of a lot of substance in a small space. They are also ranked 18 out of 192 for breed popularity, and are one of the most popular herding breeds because of their athleticism and liveliness. That makes them the perfect breed of dog to use for this adorable, entertaining, and educational infographic! This infographic from PlaygroundEquipment compares the typical weight of different animals with the equivalent number of corgi puppies and full-grown corgis. Corgis on average weigh around 26 lbs, so puppies are included to represent uneven numbers (and add more cuteness, of course!). It also provides fascinating facts about each animal, which makes this a delightful guide for children to learn about mass as well as the animal kingdom as a whole.